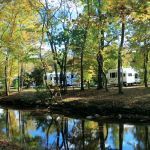 Ask fellow campers about "Up the Creek RV Camp" and nearby attractions. Very clean campsite with roomy camp spots and wonderful creek setting. No shower house or restrooms, but all sites are full hookups. We loved our stay here and will likely stay here again. We camped at Up the Creek RV Camp in a Travel Trailer. We stayed here for 6 days in a fifth wheel in a back in site. This is a nice clean park that we have stayed in 2 years ago. It is quiet and away from the hustle and bustle of Pigeon Forge. There are no facilities such as bathrooms, showers, or laundromat. There is a shuttle that stops at the park and you can ride it to town. As I recall, it's free. Would definitely go back if in that area again. 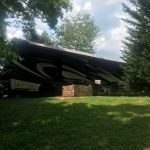 We camped at Up the Creek RV Camp in a Fifth Wheel. It's only about 10 minutes to all the attractions. This was a very peaceful setting far away from the crowds and traffic, but close enough to be a part of the action if desired. The park was very well maintained. The park was fairly flat. The sites were private because they have planted evergreens between the sites. There were horrible mosquitoes and the water pressure was low. We had a fireplace at our site. I would return to this park! 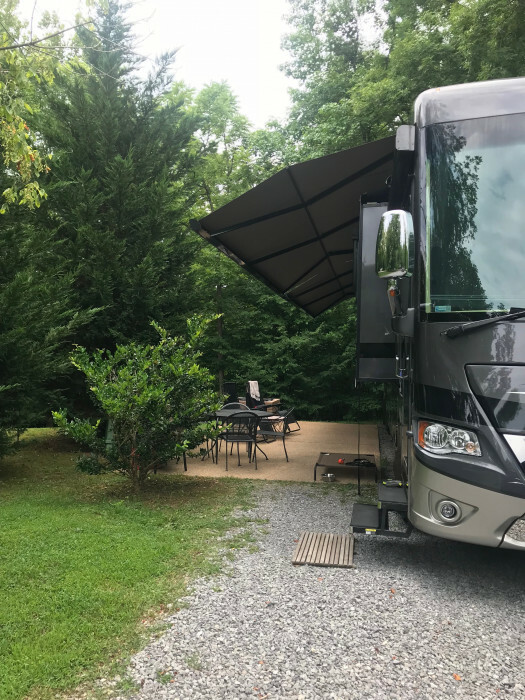 We camped at Up the Creek RV Camp in a Fifth Wheel. You cannot reserve or request a specific camp site! 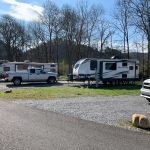 We stayed here because our regular campground we stay at in Pigeon Forge was booked. When we arrived at 12:45 pm (check-in at 1 pm) we asked if we could choose our site, we were abruptly told "you are assigned site 12". We reserved a premium creek side site months in advance. Site 12 was awful. It was narrow, so narrow in fact the water connection was about a foot from the next site's patio. The site next to ours was even worst. The sites have cement patios, patio table, chairs and a useless fire pit. The RV site was gravel and mud. We had to step out on mud every time we entered and exited our vehicle. The 16 cable channels were all blurred. We reported it and maintenance came out and said they fixed the box, but it was still terrible. He said it may be your RV. We have a new RV so I asked the sites next to ours and they said they had the same reception issues. The sewer connection was uphill and about 18 feet away, so plan on using two hoses. The trees above the premium creek side sites had orange sized fruit, which were dropping often, expect to be awaken several times a night. You had to keep your awning out to avoid being hit by one. Many sites were larger than ours, but since you cannot reserve a specific site you have about a 50 percent chance of getting a terrible site. The park has a fenced in area for dogs , which is small, dark and muddy. Just a reminder, no bathrooms, showers, laundry, recreation and no pool. So all the kids, and kids will be kids, will play in the creek next to your site, so expect no quiet afternoons naps. The evenings were very quiet. The park road is an oval and unlighted. Use caution when walking after dark. We will not return. We camped at Up the Creek RV Camp in a Travel Trailer. This is our second time in staying at the Up the Creek, and I will say that it did not disappoint. The park is very well kept, staff is friendly and helpful, and the location is just the right distance from the hustle and bustle of downtown. The location is not hard to get to and it is a very peaceful. Unlike the sites at many places it is not packed like sardines. There is ample space between each site for privacy. 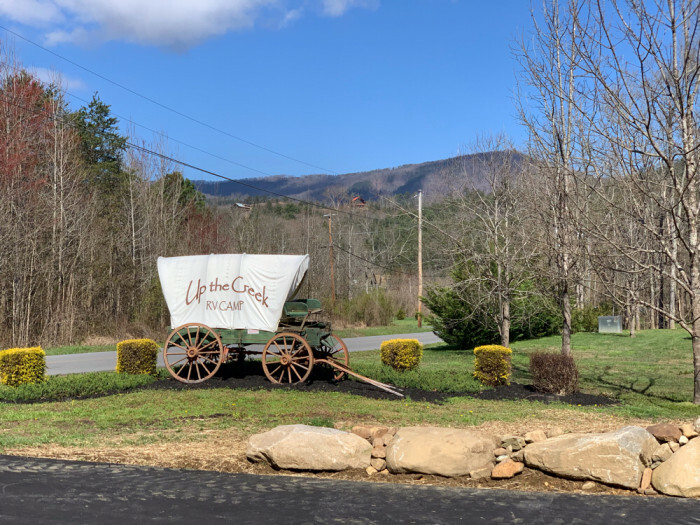 All in all it was a great stay and I would highly recommend staying at Up the Creek. 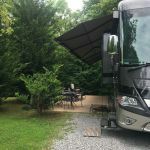 We camped at Up the Creek RV Camp in a Fifth Wheel. 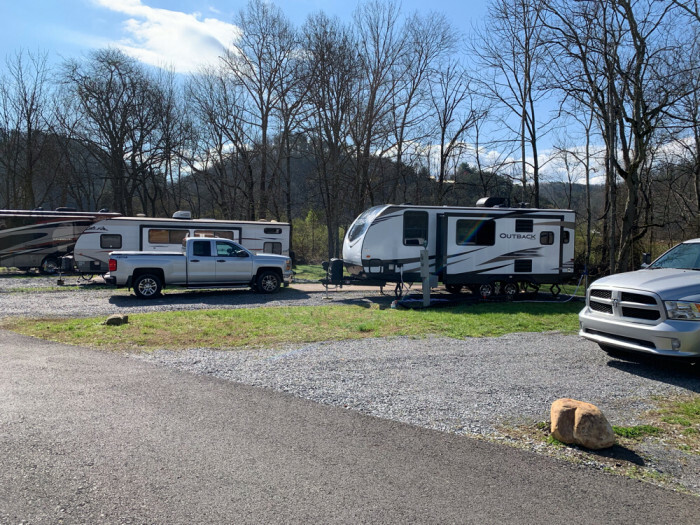 As others have stated, this is a quiet campground, about 3 miles off the strip at light #3 in Pigeon Forge (Wears Valley Road). There are no bathroom facilities, no pool, no laundry, no playground. We are fine with this, but families with small children may not be. This is a quiet campground. Paved interior roads, gravel sites. Sites have either fire pits or stone fireplaces, picnic tables or iron table and chairs, depending on the site you choose. Our site (#21) was a pull forward site facing the creek. Booked this when reserving for something different. Would not choose this site if we were to return. Site was just long enough for our coach; our tow car had to be parked across the end of the site at the end of the patio, making us feel a little closed in. In my opinion, the best sites are the back ins along Cove creek (#'s 2-16) or the pull through sites (#'s 3-5) although the pull throughs have minimal shade. Sites 15 and 16 are especially long and spacious. We had trouble with our cable and it was fixed the same day we reported it. The trolley comes into the campground throughout the day, each ride is 50 cents. Sites are checked/cleaned each time someone checks out. We would stay here again when we return to the area. We camped at Up the Creek RV Camp in a Motorhome. Lots of touristy things to do in Pigeon Forge and Gatlinburg...musuems, alpine coaster rides, go carts, mini-golf, etc. For something different, try visiting the Bush's Baked Beans Musuem in Chestnut HiIl or ziplining at Foxfire Mountain. Both a Kroger and a Publix are at light #3 in Pigeon Forge, convenient to stop in on the way back to camp. We stayed here for two nights as per a recommendation from a fellow camper. This is our second time in Pigeon Forge but first at this camp ground. Very cute. Small but clean and off the main drag but not too far. No bathrooms or shower or pool which was fine for us at this stay. Very pretty setting. Would recommend this to friends and would stay here again. We camped at Up the Creek RV Camp in a Travel Trailer. Smoky Mountains are near by. Pigeon Forge and Gatlinburg are must sees. We also went to see the Dolly Parton statue along with her home town and her home town cemetery. Very interesting. Lots to do. This is a wonderful small quiet park about 3 miles off the strip. You will have a short trek down a two lane road which is easy with no low hanging trees. My space #6 was a premium on creek side with a fire pit that was CLEAN. Pad was gravel and reasonably level. Site was VERY clean. The trolly arrives hourly so there is no need to drive into town. Wifi was marginal. Thats the biggest bummer about this place and why I didn't rate it excellent. Best part about this park is that it IS off the strip and quiet. It is also located so you can go in the backside/frontside/some side of the park that doesn't require you to deal with the strip and Gatlinburg traffic. Would totally stay here again. We camped at Up the Creek RV Camp in a Motorhome. Ask office about Sat signal. Pull throughs appear to be better for reception. This is one of my most favorite campgrounds in the area. This is the only place we will stay. We choose the Deluxe creek sites in the back with the fireplace, because the sites are so spacious, plus a long back in driveway. There is a creek that you can walk down to, to wade in or let your dogs play in. There is a dog park that is kept very clean. This campground is about 5 miles out from the strip in the country. Very peaceful and quiet. Staff very friendly. All units must be self contained as there are no restrooms or shower facilities. Big rig friendly. Round Table and 4 Chairs on a Patio Pad. We have camped here 3 times and will continue. We camped at Up the Creek RV Camp in a Travel Trailer. There is a trolley that comes every 20-30 minutes. Great Pizza Place and Country Store nearby. 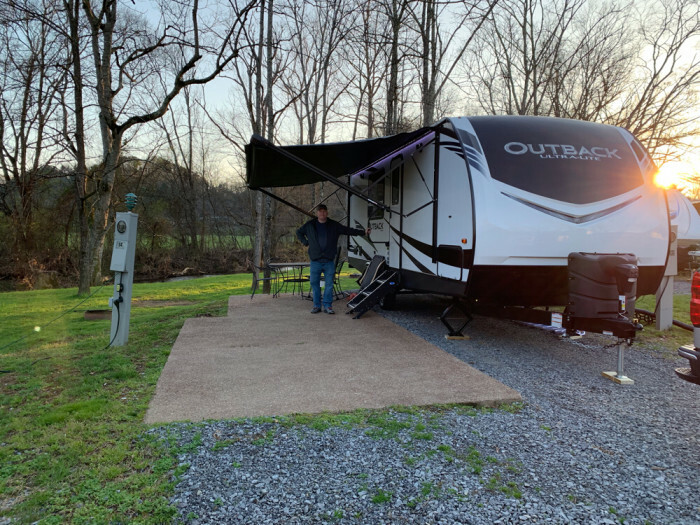 Very nice campground tucked away in Wear's Valley just a couple of miles from the Pigeon Forge strip. There are several different types of sites and we had a back-in site on the creek with a patio with a table and chairs. A fire ring is included at each site and the most expensive sites have an outdoor fireplace. The check-in was very pleasant and informative as the office staff answered my many questions on sightseeing the local area. The tram comes through the campground but April, being the off season, we opted to drive to the different locations including Gatlinburg which has paid parking. All utilities work as expected including wife and cable TV. Be careful of the large rocks along the road. We actually struck a rock making a turn which was my fault but worthy of sharing. When making reservations I suggest calling to ask about the available sites since some are smaller than others and a few have a slight incline to get into such as the back-in creekside sites. One downside is that the campground will charge $5/day for all adults beyond the first 2 which is one of the reasons why I can't give Up the Creek 10 Stars. 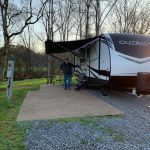 We camped at Up the Creek RV Camp in a Fifth Wheel. The Old Mill is a great place to start your visit and make sure you have lunch or dinner in their restaurant. There are actually dozens of attractions along the Pigeon Forge strip so do your homework and plan your trip. Nice and quiet. A little ways out of town. I would suggest they put in a bathroom and laundry facility. Had to go into town to do laundry. Many other campgrounds in the area but I would stay here again. We camped at Up the Creek RV Camp in a Truck Camper. Take plenty of money because this is a tourist attraction. Go through the park and take a lunch-beautiful. Sites were very nice and spacious, staff was very nice. If you have kids that come with you just make sure they don't ride their bikes too fast as their are a lot of people with pets there. We camped at Up the Creek RV Camp in a Travel Trailer. Although this campground is small, it is well maintained and clean. It was nice to be able to walk beside the creek with our dog and feel like we were not invading anyone's privacy. Creek sites are worth the extra money. Lots are spacious and mostly shady. Site surface is gravel and features a picnic table. We camped at Up the Creek RV Camp in a Motorhome. The Pigeon Forge trolley comes into the campground hourly, and it was great not having to drive in the traffic. Very nice park, Gravel sites, concrete patios with table and chairs. Sites are of very nice size, plenty of room for my 40FT RV, Full size SUV and my Tow dolly. Verizon service was excellent and park WiFi works good.I did not use the park cable TV hookup. We camped at Up the Creek RV Camp in a Motorhome. Wide, long campsites. Some are shaded, some are open. Easy to pull into. Quiet, friendly. Paved patio with table and chairs. Only a few miles from the parkway, but without the noise! We camped at Up the Creek RV Camp in a Motorhome. Lots to do in Pigeon Forge. Only a few miles from Gatlinburg with lots to do. You must drive through The Great Smokey Mountains Park, it was very beautiful and we saw black bear cubs and elk. You can take the trolley into town. We had a delicious lunch at the Old Mill Restaurant--the pecan pie was soooo good. 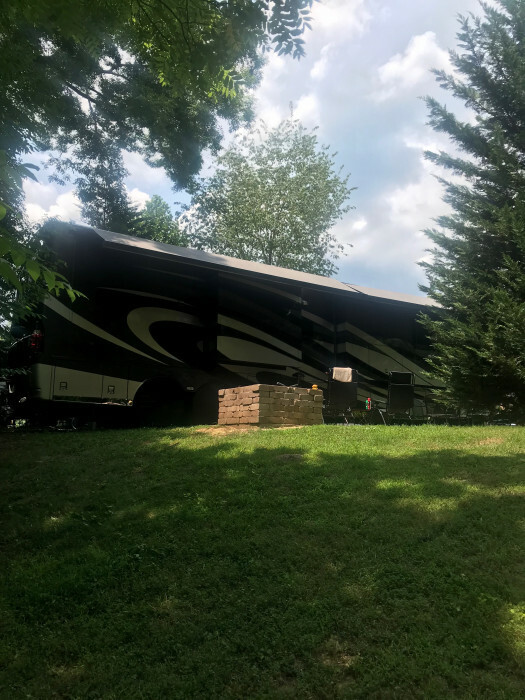 Have visited the Smoky Mountains many times but this time we stayed at the campground enjoying the streams, other campers, and relaxing. Didn't see anything but campfire and moonshine. Follow their directions to the park, not your GPS. Lots of shopping in the area. Some excellent outlet malls. 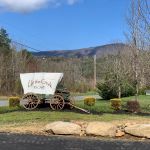 Plenty of amusement park type attractions in Pigeon Forge on the Parkway, and, of course, Dollywood is about 10 minutes away. There is trolley service in the campground. Close to attractions but far enough away to be quiet. Very close to all the activities in the Pigeon Forge, Sevierville and Gatlinburg. Parrot Mountain and gardens is worth a visit it is very interesting and well kept. There's a nifty small grocery store about a mile from the store that makes the best deserts. Are you affiliated with Up the Creek RV Camp ?